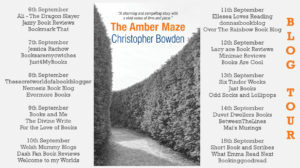 I’m so pleased to be sharing my review of The Amber Maze by Christopher Bowden today as part of the blog tour. My thanks to Rachel Gilbey from Rachel’s Random Resources for the place on the tour and for providing a review copy of the book. I was immediately intrigued by the idea of Hugh Mullion finding a key down the side of a chair and going on a search to find out who it belonged to and what it unlocked. It is indeed an interesting story that he discovers, that of Lionel, an artist who never really reached his full potential. Hugh is like a dog with a bone, digging deeper and deeper into Lionel’s life. He meets Hester, his granddaughter, who has a story to tell about Lionel’s past and about where the amber maze comes into it. I wasn’t entirely sure why Hugh was so dogged, so interested in a stranger’s life, but I suppose we’re all a bit like that. We’re all fascinated by other people’s lives and I was really interested to read of Lionel’s life through Hester and through some journals that Hugh manages to find. 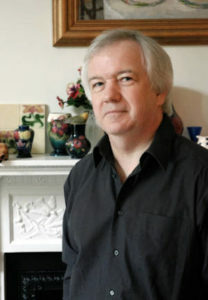 What particularly appealed to me was the search for documentation and the country house that formed a part of the story. I think it gave a real air of intrigue to the plot and it felt a bit like a treasure trail, with information rather than treasure being the prize at the end. I enjoyed the length of this book too. It was long enough to be nice and meaty but it wasn’t so long that I got fed up with Hugh’s nosiness! 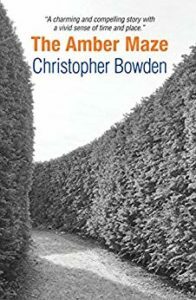 I thought it was a great piece of ‘noir fiction’ and I’d definitely look at Christopher Bowden’s back list, some of which were on my radar anyway.